We’d love your help. Let us know what’s wrong with this preview of Living Beautifully by Pema Chödrön. To ask other readers questions about Living Beautifully, please sign up. "The Tibetan word for warrior, paw for a male warrior or pawmo for a female warrior, means “the one who cultivates bravery.” As warriors in training, we cultivate the courage and flexibility to live with uncertainty — with the shaky, tender feeling of anxiety, of nothing to hold on to — and to dedicate our lives to making ourselves available to every person, in every situation." I have been a Pema Chodron fan for many years now. The Buddhist nun’s work has been critical to my on-sometimes, off-sometimes (but not steadily on, thankfully) meditation practice. 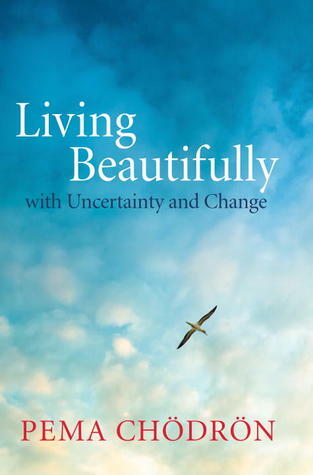 In Living Beautifully, Chodron writes with her trademark simplicity and directness about living with uncertainty, opening our hearts to transitions and pain through tonglen practice and learning that the “time of the lone wolf is over” and we cannot make any real changes to ourselves or the world on our own. I’m biased because I’m a Chodron fan, but this one is really great. It challenged me to work with being open, despite my inclination to judge my reactions to life and to close down emotions and feelings and to shut down to people who make me uncomfortable. The book is based on a series of talks, it comes with a mini-guide at the end to some of her other works, including Start Where You Are and When Things Fall Apart. Look, it's impossible to not like Pema Chodron if you are someone who in interested in spiritual enlightenment. She is an American raised Buddhist who writes in the style anyone can understand and relate to. She's not overly "God" in her dialogue, and she's very down-to-earth. She's not out of touch with the realities of life. This is NOT a self-help book. This is a self-AWARENESS book. It's about how to live with and accept the crap and the glory in life. It's how Buddhists make it through the Look, it's impossible to not like Pema Chodron if you are someone who in interested in spiritual enlightenment. She is an American raised Buddhist who writes in the style anyone can understand and relate to. She's not overly "God" in her dialogue, and she's very down-to-earth. She's not out of touch with the realities of life. This is NOT a self-help book. This is a self-AWARENESS book. It's about how to live with and accept the crap and the glory in life. It's how Buddhists make it through the day. It's practical and very, very helpful as a daily reminder of how you need to check your own s*&t in life and stop checking others. A smart, packed-full slim volume that is ideal beside reading. Reminds us of what matters in this life. This is one book you will NOT regret owning. A beautiful rendering of The Three Commitments written in a very accepting and peaceful tone that felt like a discussion with a kind, brilliant friend. Much to ponder if you are interested in and open to it. Such a beautifully written little book. As a son or daughter returning home." There is nothing that I can say that can match the beauty of this book. I have read quite a few of Pema's books by now, and this is by far, the most practical of those. Not that the others were impractical, but here Pema is vividly honest, interspersing her own life experiences with many practices that can make the task of living more joyful and utterly simple. Initial reaction: I thought this open approach to mindfulness and meditation was worth the read, but probably a bit redundant if you've read other works in Chodron's bibliography covering the same topic. Still, I appreciated her words and approach in one volume. I'll start this review by saying that I've always appreciated reading Pema Chödrön's inspiring expansions on approaching life and meditation practices. I've read a number of her narratives in the past, so it was with little wo Initial reaction: I thought this open approach to mindfulness and meditation was worth the read, but probably a bit redundant if you've read other works in Chodron's bibliography covering the same topic. Still, I appreciated her words and approach in one volume. I'll start this review by saying that I've always appreciated reading Pema Chödrön's inspiring expansions on approaching life and meditation practices. I've read a number of her narratives in the past, so it was with little wonder that I picked up this particular work and found it immersive and a meditation in and of itself. Had me thinking on so many things, but also learning from it in a sphere that's both similar and separate from my own in ideology. Her articulations are sound, and it's easy for someone who may not necessarily be familiar with these Buddhist vows to be understand what they entail and how to put them into practice for inspiration. They're simple messages, but are far more profound in the measure of interpreting and integrating what they mean in one's day-to-day life and understanding the world around them. The long and short of the aim of this narrative is describing three rules to approaching uncertainty and change (staying grounded) in the present world. The outline of these three measures compose the bulk of the book, and Chödrön uses each section to articulate what each of these mean in different facets, both in her personal experience as well as applications and expansions beyond. It's a constructive imaging in some measures, and others instructive. I did somewhat read it through a filter as not all of the measures apply to my respective life or ideology, but I learned quite a bit on the part of Buddhist ideals and expansions reading this book and how these three approaches come into place. It is a book that emphasizes becoming more self-aware and realizations made in that spectrum, which is something that I respected. As far as a meditation measure is concerned, I think there are other narratives of hers that are a little more oriented towards that spectrum, so this wouldn't be my recommendation for an introduction in that scope, but it's still worth reading for the expansion on these ideals in themselves, to get people thinking on the matters presented. I'd say it's more of a supplement to Chödrön's other narratives, and notably powerful in its own way. Pema Chodron's books are full of wisdom, and I say this because I have read many of them and talked with others who have read them. This book is not only for our precarious lives today but for all times. She helps us understand that it is not the circumstances that threaten us but our reaction, our resistance to "the fundamental uncertainty of our situation" that causes our suffering. We need to let the truth of "how things really are" sink in by being fully present, feeling our hearts, and meet Pema Chodron's books are full of wisdom, and I say this because I have read many of them and talked with others who have read them. This book is not only for our precarious lives today but for all times. She helps us understand that it is not the circumstances that threaten us but our reaction, our resistance to "the fundamental uncertainty of our situation" that causes our suffering. We need to let the truth of "how things really are" sink in by being fully present, feeling our hearts, and meeting each moment without an agenda. Meditation helps this to become familiar ground upon which to live our lives, it helps us establish a habit of seeing the truth of what hooks us, so we can recognize it more easily in our daily lives. Acknowledging that we're hooked (with a sense of compassion for ourselves) is the first step to liberating us from that suffering: "...we will come to experience life's impermanent and changing energy not just as threatening, but also as refreshing, liberating, and inspiring." Beyond compassion for ourselves is our compassion for others. She describes bodhicitta as "...a trust in our innate ability to go beyond bias, beyond prejudice and fixed opinions, and open our hearts to everyone..." It helps loosen us from narrow thinking and our resistance to change. Pema points out that this may need to happen very gradually, and we need to be okay with making even a little more headway each time we recoil in fear from meeting this particular edge. "We live our lives as an experiment." Our strong intention to make headway and our compassion for ourselves and others keeps us going. In which I realize that I am not yet a Buddhist and may never be one. Helpful insights abound in this book but I found myself being contrary as I read it, which I am pretty sure is not at all the point of Buddhism. I am still really attached to my emotions, even the ones I don't like, and while I loved learning that most emotions only last for 90 seconds before they pass unless we feed them, sometimes I want to feed my emotions. Simultaneously while reading the book, my family is preparing for th In which I realize that I am not yet a Buddhist and may never be one. Helpful insights abound in this book but I found myself being contrary as I read it, which I am pretty sure is not at all the point of Buddhism. I am still really attached to my emotions, even the ones I don't like, and while I loved learning that most emotions only last for 90 seconds before they pass unless we feed them, sometimes I want to feed my emotions. Simultaneously while reading the book, my family is preparing for the imminent loss of a very beloved person. She's elderly and ill and has recently rejected supportive care. Her body is dying and I am very, very sad at the loss of this very special soul. And I want to be sad for longer than 90 seconds. I want to really feel and feed that sadness for a while, not detachedly name and observe the sadness, but fully participate and embrace the grief. This book will end up changing my life, in a utility kind of way. I have read, and learned about several of the techniques Pema Chödrön suggests for dealing with the storm constantly beating down on us throughout life, but this time, with her book it means more. This book will be meaningful to those that are seeking joy, amongst turbulence, but also open minded enough to see that their self made narrative, or adopted narrative will prevent them from moving forward. I really hesitate to write these This book will end up changing my life, in a utility kind of way. I have read, and learned about several of the techniques Pema Chödrön suggests for dealing with the storm constantly beating down on us throughout life, but this time, with her book it means more. In life, spirituality, religion, culture, etc.. humans, and the groups we associate ourselves with, will often come up with strategic outlines, or sometimes allegories to help us deal with the commotion and turbulence that life unyieldingly barrages us. One theory is to build a sturdy foundation. I call this fortress mode. In short, we write our narrative and surround it with a super fortified set of guards and protections so that the world around us can't shatter our story. The problem with fortress mode, is that we have to have the narrative written before the walls go up. We decide how our life will be, and what is right and wrong, and what the end goal is. This works really well, but I can tell you right now that its very hard to adjust your narrative at that point. Its hard to see whats happening on the outside, and its harder to receive further light and possible new hooks for your story when you no longer have access to the outside. Fortress mode works well for those who "know" they got it all figured out. Pema Chödrön introduces a context that requires no fortress walls. The concept is beautiful, because it makes us the fortress. It turns us into dancers, who know how to ride the storm, and to not let it pull us under. There is no narrative, and story. The story gets written day by day, and possibilities for new light, and new understanding are readily available. Its focus is to live in the present, and to keep vows, and commitments as sacred, internally. I love the 2nd commitment, which is known as the Warrior Vow, or Path of the Warrior. This commitment is to help everyone, to heal everything, to be one who is strong enough to run out into the storm, and pull people in under shelter. As I alluded to earlier though, the real power in Living Beautifully (which is what this book is called, but also what I am calling this philosophy on surviving the storm), is that joy, and happiness is found in everything. In fortress mode, if one of your walls breaks down, and part of your story is altered, it brings great anxiety and pain to try and fix it. No such thing exists when living beautifully. Hard times will beat you down, and seeing the beauty in that moment shapes us more profoundly than any cloistering up tactic of self preservation. I am exhausted of these books and the fact that I am so tired tells me that I probably need them all the more, that I am burning out because they are the right thing, that I am unwilling to internalize them because they are so potent. The point of this book—and others like it—is that resistance is futile, that to be whole, we must lean into the dogs that chase us in the night, that we must accept the hard things, the angry things; we must meet darkness in full, move within it and then, perhaps, I am exhausted of these books and the fact that I am so tired tells me that I probably need them all the more, that I am burning out because they are the right thing, that I am unwilling to internalize them because they are so potent. The point of this book—and others like it—is that resistance is futile, that to be whole, we must lean into the dogs that chase us in the night, that we must accept the hard things, the angry things; we must meet darkness in full, move within it and then, perhaps, we will find enlightenment. It’s a hefty promise and a simple premise but deceptive too. Frustrating. The acceptance mindset of Buddhist principles like the three vows Chodron discusses in Living Beautifully feels as timeless as the day and night, but that doesn’t make it any easier to put into action. Knowledge is not always freedom. Sometimes it’s the light coming through the bars on the cage that you are too tired to break out of. زندگی نوعی مطمئن نبودن,بی خبر بودن از نوع وچگونگی اینده است.لحظه ای که به چند و چون ان پی ببرید مرگ تدریجیان شروع میشود.هنرمندان هیچ گاه به طور کامل پی نمیبرند.ما حدس میزنیم.شاید اشتباه کنیم,ولی همچنان بی گدار به اب میزنیم. ما انسانها هر وقت تشخیص میدهیم که همه چیز در اطرافمان در بی ثباتی به سر میبرد.برای یافتن یقین تلاش میکنیم .انگار در ایام گرفتاری تنش حاصل از تلاش برای یافتن زمین سفت-چیزی قابل پیش بینی و امن که رویش بایستیم-تشدی زندگی نوعی مطمئن نبودن,بی خبر بودن از نوع وچگونگی اینده است.لحظه ای که به چند و چون ان پی ببرید مرگ تدریجیان شروع میشود.هنرمندان هیچ گاه به طور کامل پی نمیبرند.ما حدس میزنیم.شاید اشتباه کنیم,ولی همچنان بی گدار به اب میزنیم. There is much to ponder and integrate in this little book. The three main themes are to committing to not cause harm, committing to take care of one another and committing to embrace the world just as it is. It's written in the context of living with uncertainty and change and this would be a good book to go to when our lives hit those bumps in the road. This is more focused perhaps than her other works. She is able to impart her wisdom of some similar concepts in completely new ways so that no book seems duplicative to me. Still she promotes tonglen practice more than meitri which always surprises me. Wow wow wow. I can not recommend this book highly enough. Favorite recommendation: if you’re entering into an emotionally challenging situation, be present, feel your heart, and engage in the next moment without agenda. I will definitely reread this one! Buddhist Pema Chödrön offers inspiring, down-to-earth advice for those of any or no religion on dealing constructively with the human condition. The book centers on three traditional Buddhist vows – to do no harm, to do good, and to see the world as it is – which aren’t about being moral but “about opening ourselves to a vaster perspective and changing at the core.” To make this change we need to be honest and kind with ourselves while confronting our mental and emotional habits: “Buddhism holds Buddhist Pema Chödrön offers inspiring, down-to-earth advice for those of any or no religion on dealing constructively with the human condition. The book centers on three traditional Buddhist vows – to do no harm, to do good, and to see the world as it is – which aren’t about being moral but “about opening ourselves to a vaster perspective and changing at the core.” To make this change we need to be honest and kind with ourselves while confronting our mental and emotional habits: “Buddhism holds that the true nature of the mind is as vast as the sky and that thoughts and emotions are like clouds that, from our vantage point, obscure it…. The thoughts and emotions may make it difficult for us to contact the openness of our minds, but they’re like old friends who have accompanied us for as long as we can remember, and we’re very resistant to saying good-bye” to them. Together, the three vows help people contact their vaster self and its fundamental goodness. The first vow, to do no harm, involves refraining from (not repressing or denying) particular harmful actions, but Pema explores a more profound aspect: “The commitment is to refrain from speech and action that would be harmful to others and then to make friends with the underlying feelings that motivate us to do harm in the first place.” To control speech and actions we must be aware of the thoughts and feelings behind them. Meditation and other mindfulness practices keep awareness in the present moment and let us observe our thoughts and feelings without identifying with them. Practicing letting go of the mind’s contents when calm helps later in upsetting situations. Neurologically emotions last only about ninety seconds; when they last longer we are re-energizing them with our thoughts about what happened. With mindfulness we can learn to stop feeding these feelings. The second vow, to do good, puts us on the bodhisattva or warrior path, which requires the cultivation of courage, empathy and love. Consciously opening up to the world’s pain – the pain of those we like, those we don’t like, and those we don’t notice or will never meet – in order to relieve it requires strength, fearlessness and determination: “Compassion is threatening to the ego. We might think of it as something warm and soothing, but actually it’s very raw. When we set out to support other beings, when we go so far as to stand in their shoes, when we aspire to never close down to anyone, we quickly find ourselves in the uncomfortable territory of ‘life not on my terms’.” Compassion isn’t the strong pitying or supporting the weak, but a relationship of mutual support between equals. The practice offered for this vow is breathing in the pain of others and then breathing out relief. This counteracts the human tendency to take in relief and give out or reject pain. The author also suggests that when we realize we’ve closed down or are beginning to lose it, we come back into the present, getting in touch with our body, mind and feelings; feel our heart, “literally placing your hand on your chest if you find that helpful,” accepting yourself as you are right then; and then “go into the next moment without any agenda,” opening to the person or situation in front of you and dropping the storyline you were telling yourself about it. The third vow, to embrace the world just as it is, means “to develop a complete acceptance and openness to all situations and emotions, and to all people, experiencing everything totally without mental reservations and blockages, so that one never withdraws and centralizes into oneself…. being completely present and open to all sights, all sounds, all thoughts – never withdrawing, never hiding, never needing to jazz them up or tone them down.” As we become less self-absorbed, less attached to a vision of who we are, and less controlled by our fearful ego, we begin to see our opinions and vision of things as simply our opinions and visions. Instead of dread or a need to control, we develop curiosity. Everyone is bound to break the three vows over and over. Each time we do, we start again from wherever we are and reaffirm the vow. “Together, the three commitments form the education of the warrior. On the warrior path, we train in never turning away from our experience. And when we do turn away, it’s based on being able to discriminate between turning away because we know we can’t handle something at the moment and turning away because we don’t want to feel what we’re feeling, don’t want to feel our vulnerability. But we don’t develop this discrimination all at once. We get there inch by inch, moment by moment, step by step, working with our heart and mind.” This book is an excellent aid on this path to becoming more fully human. "We have a choice. We can spend our whole life suffering because we can't relax with how things really are, or we can relax and embrace the open-endedness of the human situation, which is fresh, unfixated, unbiased." A really great book that found me at a really opportune time. As a person who deals with fear by bracing myself and rushing through, the practices described are challenging and I believe will help me in the long run. I borrowed this from the library and I think I will re-read to enjoy it all over again. concise, eloquent, inspiring, loving. like spending time with a beloved, wise friend. "How can we make friends with unpredictability and uncertainty--and embrace them as vehicles to transform our lives?" (3-4). "Looking deeper, we could say that the real cause of suffering is not being able to tolerate uncertainty--and thinking that it's perfectly sane, perfectly normal, to deny the fundamental groundlessness of being human" (8). "Acknowledge the feeling, give it your full compassionate, even welcoming attention, and even if it's only for a few seconds, drop the story line about t "How can we make friends with unpredictability and uncertainty--and embrace them as vehicles to transform our lives?" (3-4). "Acknowledge the feeling, give it your full compassionate, even welcoming attention, and even if it's only for a few seconds, drop the story line about the feeling. This allows you to have a direct experience of it, free of interpretation" (13). "Be fully present. Feel your heart. And engage the next moment without an agenda" (21). "When you refrain from habitual thoughts and behavior, the uncomfortable feelings will still be there. They don't magically disappear.... You're left with the feelings you were trying to escape. The practice is to make a wholehearted relationship with that" (36). "Instead of letting our regrets drag us down, we can use them to spur us on to not repeat harmful acts but to learn from them how to be wiser in the future. We are fundamentally good, not fundamentally flawed, and we can trust this" (38-39). "You build inner strength through embracing the totality of your experience, both the delightful parts and the difficult parts. Embracing the totality of your experience is one definition of having loving-kindness for yourself. Loving-kindness for yourself does not mean making sure you're feeling good all the time--trying to set up your life so that you're comfortable every moment. Rather, it means setting up your life so that you have time for meditation and self-reflection, for kindhearted, compassionate self-honesty. In this way you become more attuned to seeing when you're biting the hook, when you're getting caught in the undertow of emotions, when you're grasping and when you're letting go. This is the way you become a true friend to yourself just as you are, with both your laziness and your bravery. There is no step more important than this" (53). "The truth is that we're always in some kind of in-between state, always in process. We never fully arrive. When we're present with the dynamic quality of our lives, we're also present with impermanence, uncertainty, and change" (61). "Many years ago, one of the monks at Gampo Abbey introduced me to the practice of saying to myself when I wake up, 'I wonder what will happen today.' That's the spirit of taking a leap" (73). "With the commitment to embrace the world just as it is, we begin to see that sanity and goodness are always present and can be uncovered right here, right now" (116). "I realized then what it means to hold pain in my heart and simultaneously be deeply touched by the power and magic of the world. Life doesn't have to be one way or the other. We don't have to jump back and forth. We can live beautifully with whatever comes--heartache and joy, success and failure, instability and change" (134). Slowly revisiting this book has been deep nourishment. “Living Beautifully with Uncertainty and Change” is an invitation to be here where we are with an openness and willingness of heart and mind. It is also an invitation to look at our inner commitments. I appreciate that Pema includes some of the ways the teachings have assisted her to shift her own personal struggles through the years. She is transparent and real. Each person's life is a like a mandala ~ a vast, limitless circle. We stand in the Slowly revisiting this book has been deep nourishment. Each person's life is a like a mandala ~ a vast, limitless circle. We stand in the center of our own circle, and everything we see, hear, and think forms the mandala of our life. We enter a room, and room is our mandala. We get on the subway, and the subway car is our mandala, down to the teenager checking messages on her iPhone and the homeless man slumped in the corner........We're lying in a hospital bed, and the hospital is our mandala. We don't set it up; we don't get to choose what or who shows up in it. It is.....'the mandala that is never arranged but is always complete.' And we embrace it as it is. Everything that shows up is a vehicle for your awakening......."
This is about building inner strength, emotionally and mentally. Choosing to be brave! Chodron explains about taking a fresh look at your belief system that causes pain and suffering and going through the process of releasing and finding your true self. Chodron says that we all cling to fixed ideas and our fixed identity and therein lies the problem. Unmask, let go, open the mind and heart. Be totally honest. She uses a metaphor of a rapidly moving river as life. We are clinging to the shore, af This is about building inner strength, emotionally and mentally. Choosing to be brave! Chodron explains about taking a fresh look at your belief system that causes pain and suffering and going through the process of releasing and finding your true self. Chodron says that we all cling to fixed ideas and our fixed identity and therein lies the problem. Unmask, let go, open the mind and heart. Be totally honest. She uses a metaphor of a rapidly moving river as life. We are clinging to the shore, afraid to let go. “Those who cling to the shore will suffer greatly.” The advice is to let go of the shore and push off into the middle of the river, see who is there, and celebrate. All life is an “in between state” and uncertainty a constant. Getting comfortable with uncertainty and change is essential to a happy life and relationships. Most of this philosophy comes from Buddhism. I’ve read a few of Chodron’s books and so far this one is the best. There is an excellent instruction on meditation and explanation about posture, eyes, mouth, hands, and breathing. Rewarding reading all the way through! Pema Chodron is my favorite spiritual teacher. Whenever I feel sad or depressed I always go to her teachings or listen to her audio books. She is always wise,funny and down to earth. In this book she talks about how to embrace life as it is, how to embrace groundless and restless and how to refrain from bad habits that make our life worse. She talks about three commitments that we need to make in order to have better life. This is not about chasing happiness or temporary pleasures but it is rath Pema Chodron is my favorite spiritual teacher. This is a hard book to categorize because I think whether you like it or not will be where you are in your life and whether you are ready for it. I definitely like the book's philosophy and do recommend. Thanks to Cindy / Isaac for ha This is a hard book to categorize because I think whether you like it or not will be where you are in your life and whether you are ready for it. Thanks to Cindy / Isaac for having this on my bedstand when we stayed! Pema Chodron parla un inglese semplice, è quietamente spiritosa e la si ascolta volentieri su youtube. In questo testo molto pratico da' insegnamenti incoraggianti sui Tre Impegni, mettendoli idealmente a disposizione di chiunque. Piu' alla mano ed intelleggibile di altri colleghi asiatici, il libro è un ottimo viatico per un cambiamento sottile ma credo assai potente ed utile. Hi, I'm a control freak, who probably needs to reread this book on a weekly basis. Pema Chodron never disappointing me. This book is full of usefulness and inspiration.